1. Preheat the oven to 200°C, gas mark 6. Put the chicken and peppers into a large roasting tin, sprinkle with the spice rub and coriander stems. Season and toss together until everything is well coated. 2. Roast for 20 minutes, turning once, until golden and tender. Add the tomatoes to the pan and cook for 5 minutes more, until the chicken is cooked through and there is no pink meat. 3. 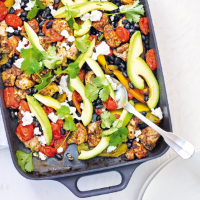 Stir the beans into the hot pan, then scatter over the avocado, cheese and coriander leaves. Serve with lime wedges to squeeze over. Delicious with warm flatbreads. This recipe was first published in April 2017.